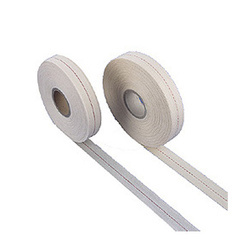 Our range of products include cotton webbing tape. Cotton Webbing Tape offered are developed using quality yarn and find wide application in processes in the garment industry and others. Here, our expertise also lies in making these available in customized finish specifications as demanded by the customers. Further, we also ensure that the webbing tapes offered to deliver relatively strong finish as well as the capability of absorbing more moisture without feeling dampness.